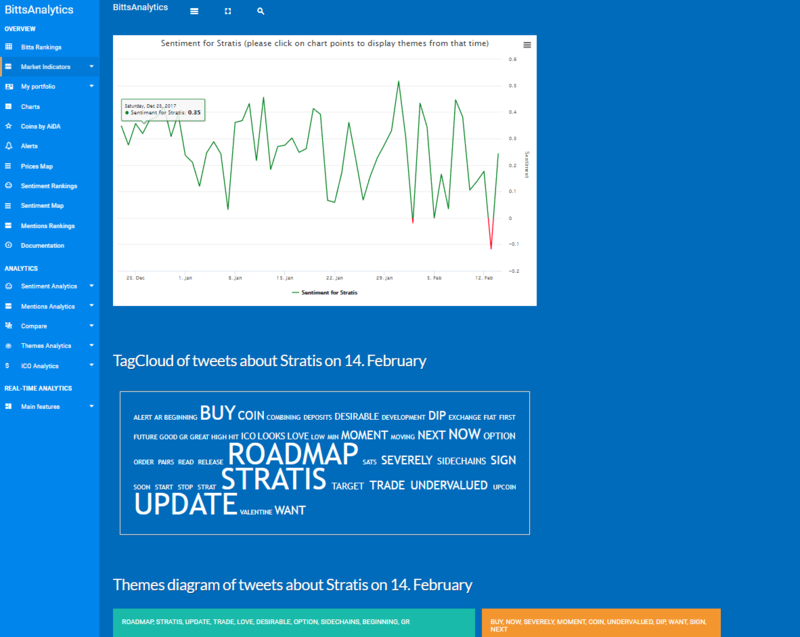 As an example of how we use BittsAnalytics platform to get immediate feedback about a particular initiative of a cryptocurrency let us take as an example Stratis yesterday. If you display the chart of daily sentiments on our platform and then click on the last day of the chart you get tagcloud from social media posts on that day as well as themes of similarity from the same posts. You can immediately see that the main topic dominating discussions is the roadmap update. And since the sentiment jumped we can assume that the community took the roadmap update positively and infer that it should be positive for the price of Stratis. It is also interesting that our NLP analysis of themes discussed returns these words: buy, now, severely, undervalued, dip, want. If you want to use this and many other kind of analytics tools and data to improve cryptocurrency trading read more about platform at www.bittsanalytics.com.